My mother’s death had made me the sole heir of a car that, while inadequate by international standards, was satisfactory by our local ones. We are not very demanding in the matter of cars. My “brand new” 1970 Moskvitch was a treasure on wheels. “Are you a writer?” the mechanic asked. To mechanics, writers are people with clean hands and lots of money. To writers, mechanics are people with dirty hands and lots of money. My mother didn’t leave me any money, but she did leave some things of value: an upright piano and lots of sheet music. Her music. All I can do with the instrument is to put my hands on the keys and have them respond without much conviction. Still, out of all the objects she left that cluster indifferently around me, that piano feels the most my own. I also inherited a porcelain table setting, silverware that’s truly silver, and linen tablecloths. Also glassware of all sizes and sorts. Endless treasures that have no means of locomotion. We take care of them all our lives, and they almost always survive us. Also she left me a gaping void of loneliness, at the age of thirty-seven. What’s the net weight of a writer, I asked myself before replying to the question. The number of books? The number of prizes? The tally of foreign publishers? The crowd of reporters pursuing you? The quantity of gossip? “I’m no writer,” I told him while trying to understand what he was doing to the car and promising myself not to be deceived again. I don’t write stories, novels, or poetry. I don’t publish books, win prizes, or get interviewed anywhere. Nobody recognizes me on the street. Nobody snipes at me. That answer, I thought, would be true. “So what do you do?” The voice emerged from under the car, from the space lit by a crude lantern he must have invented himself. I awaited the indifferent “Oh” of someone who has inquired merely to have something to say, but instead the mechanic wanted to know whether I liked my job. “And how do you get along with them?” continued the interview from underneath the car. “You’re right. None of it keeps me awake at night.” That was the truth, in fact. “The shape this car is in, you’re a brave girl driving it around. It’s a miracle you’re alive. Look at this steering.” He made that last comment for his own benefit, since I couldn’t see anything. “Yes, I’m very brave.” My point was that he shouldn’t see me as a damsel in distress and subject to swindles. Brave I am not. That’s why I’ve never written anything but class preparation notes. I’d be completely unable to come up with striking answers if I were asked about my next work in progress, or the literature being written on or off the island, or how I manage to write with so much else to keep me busy. Other than the sacred profession of teaching, I don’t have anything to keep me busy. No animals, no plants. I have books, but they’ll stay alive even without dusting. I have a room of my own and all the time in the world. In other words, I’d have no excuse for not being a magnificent writer before even composing my first line. Those were my thoughts as I watched the decrepit Moskvich pant and hiccup at each touch of the mechanic, every time he tightened, loosened, or straightened anything. Reprinted by permission of City Lights Books. Mylene Fernández (born 1963, Havana) has published five books of stories and two novels. Her work has been translated into Italian, German, French, Finnish, and English. She is currently completing a sixth story collection and working on a third novel. She resides alternately in Havana and in Lugano, Switzerland. 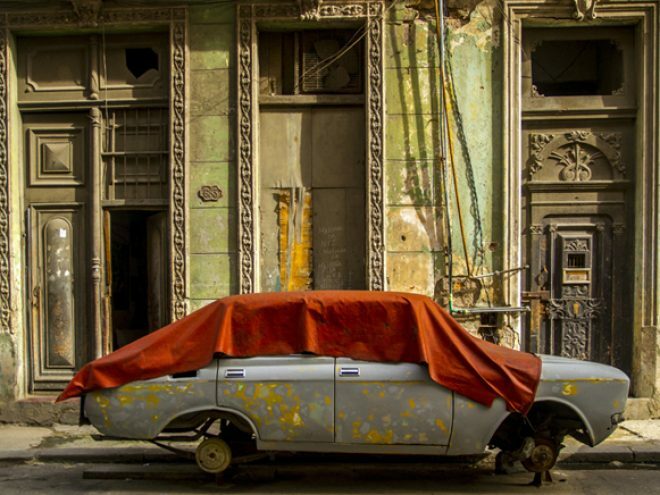 In contemporary Havana, “Do I stay or do I go?” is always the question, and love doesn’t necessarily conquer all. In the wake of her mother’s recent death, Marian has been keeping to herself. A cautious, reserved professor of Spanish Literature, she has no idea that her quiet life is about to be turned upside down. When she’s asked to review the work of a young, ambitious first-time novelist, she meets Daniel, and their love affair leads her to question both the choices she’s made so far in her life and the opportunities she might yet still have. Theirs is the story of an intense and impossible love, set in today’s Havana, a city where there can be no plans, where chance is the order of the day and a fierce sense of loyalty and pride coexists with the desire to live beyond the island’s isolation. Their love affair is marked by the ever-present choice of staying on the island or migrating out, a choice Cubans face on a daily basis. The hope of a common future shatters into individual and incompatible goals, as the dilemma of “living or leaving” is confronted with humor, irony, and a dose of melancholy. “A Corner of the World is a story of a city and its people—a love story in which Havana is the ally and also the observer of its inhabitants. To that city Marian, the main character, is our guide, introducing us to settings and characters, to their hopes, frustrations, and rejections. Some live on memories, others take to the seaside Malecón to sustain their unfulfilled dreams. To read this book is to encounter one of the best and most intimate works of Cuban literature of the 21st century.”—Mabel Cuesta, author of Cuba post-soviética: un cuerpo narrado en clave de mujer.